The importance of the Rare Book and Manuscript CRAI Library derives from the size and quality of the collection it houses. 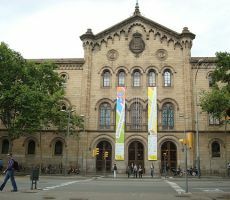 Following the passing of ecclesiastical confiscation laws in 1835, Barcelona's library collections from convents, which possessed numerous important manuscripts, incunabula and prints dating from 1501 to 1820, were brought together at the University to create a major public library. Today, these items are the core pieces in the Rare Book and Manuscript collection, which also contains a set of engravings and parchments and donations, such as the Grewe collection on food and gastronomy. The Rare Book and Manuscript CRAI Library takes part in external projects and in Spanish union catalogs. NOTICE: from 15 to 17 April from 8.30 a.m to 15 p.m. The Rare Book and Manuscript CRAI Library has specific conditions, as access to its collections is restricted. The Library has two rooms: the manuscript rooms and the consultation room. Manuscripts room, where classes can be taught using documents from the library (+ information). Consultation room, and 15 reading desks. Documents must be requested from the room's librarian (+ information).